The first year I had a baby, I changed my relationship with winter. Eliot was 5 months when winter descended upon Saskatoon, and still small enough that those terribly awkward bucket seats and freezing cold cars really made any outing less appealing. Yet I was a new mom at home with my son. Craving interaction and needing to get some work done (I was a singer/songwriter booking a Western Canadian tour at the time), I would walk daily down to the Two Twenty. Curtis would watch Eliot--who most likely fell asleep on the short trek--and I would spend a couple of hours working or visiting before walking home in the deep snow. How novel. I grew up in the suburbs believing that I had to survive winter by escaping it--in my car, in my house, indoors. But in the simple attempt to get my new baby some fresh air, a nap in the stroller, or some time to myself while I walked him, I came to love winter. Embrace it. Crave it. Soon we abandoned the car altogether, only possible because we lived in Caswell Hill relatively close to the amenities we needed. Now we live in Element Urban Village, and I'm experiencing anew that fascination with winter as I watch it transform the river bank into a winter wonderland. And what I see from that view overlooking Victoria Park is a city eager to reach its full potential as a winter destination. I see people running along the Meewasin. Winter bikers commuting or road biking in large groups. Walking dogs. Sledding on hills with a bare skiff of snow cover. In the last few years, Curtis and I have had the opportunity to travel to cities that embrace and exploit winter and all that it has to offer. We went to Winnipeg and skated their Red River Mutual Trail--the Guinness book record holder for the longest naturally frozen skating trail, dotted with warming huts designed through an international art and architecture competition. We ate at Raw Almond, a pop-up restaurant resurrected on Winnipeg's frozen river. We visited Iceland, where warm outdoor pools run winter long. Inevitably, these voyages have inspired many conversations about what Saskatoon can do to realize our potential as a winter city. The City is currently working on a Winter City Strategy, so we thought we'd share some of our wild musings as you spend the holidays enjoying the snow, hopefully inspiring your own ideas for how Saskatoon can embrace winter. SaskPower’s Queen Elizabeth power plant dumps enough waste heat into the South Saskatchewan River that it can keep it it flowing with open water in -40C weather. Think about it. That’s a LOT of wasted energy. Let’s buy that heat from SaskPower and put it to better use, so that the river freezes over. 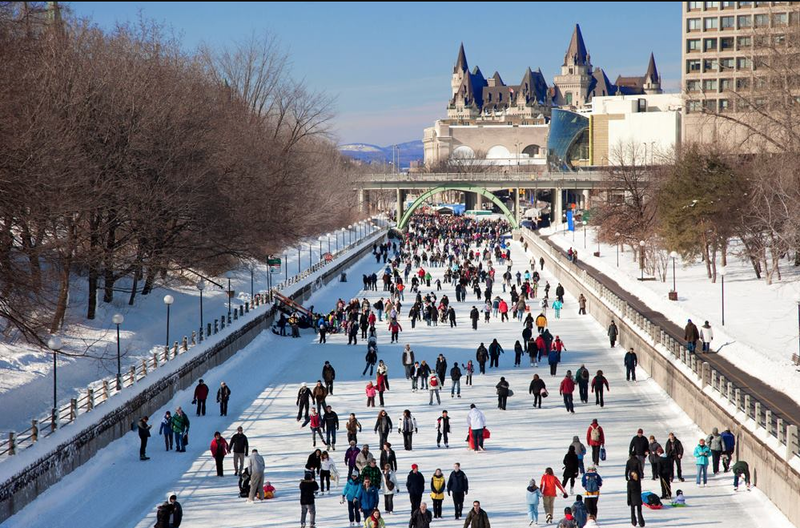 Like the Red River skating trails in Winnipeg or Ottawa's Rideau canal, a frozen river offers huge possibilities for building spaces for outdoor play. We could clear skating paths from Wanuskewin to the Berry Barn. Skating becomes a journey through the city. How about cross country skiing on the river? Hockey and curling rinks? Let's host the world's largest snowball fight annually. Or toboggan down the slopes of the riverbank onto the ice. Let's take a hugely popular model from Winnipeg and bring it to life in Saskatoon. Every year Raw Almond erects a pop-up restaurant featuring some of their best local chefs and sells out tables for 20 days serving brunch and dinner. Whether you're seeking a new experience or culinary excellence, this is an adventure worth sharing! We've already got our tickets for 2017! 4. Riversdale Pool as winter spa? Let's think back to the waste heat from the QE Power Plant that we now have an abundance of. How about we use it to heat Riversdale Pool year round? I'll admit, I wouldn't have thought this to be a pleasurable experience myself until I traveled to Iceland, where the outdoor swimming pool is a multi-generational hub of community activity even in winter. Think of all the possibilities for expanding the WinterShines Festival down onto the frozen river! Add winter fireworks and we’re off to the races. The City of Saskatoon can do a great deal for creating the conditions for a cultural shift to occur: where we enjoy rather than endure winter! Let's start the conversation. Share your ideas or experiences of winter cities and let's share that insight with the City as we move forward. I'll get my skates sharpened.